By Todd Gardner and Jay HemdalIntroduction The boarfish, Capros aper is a temperate (cool) water species, usually found at depths of 40 to 700 meters. Although it is a popular exhibit species for public aquariums in Europe it is not available in the ornamental fish trade because commercial collectors tend to concentrate their efforts on tropical reef species. However, this may change as cool-temperate and deep-water species become more popular as chiller technology improves and prices become more reasonable. The deep, compressed body, tall dorsal spines, pronounced pelvic fins and tapered, terminal mouth of the boarfish impart a distinctive appearance that makes this an extraordinary fish for display. 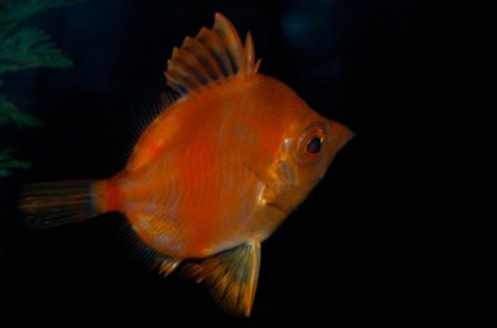 The reproductive biology of the boarfish is similar to that of many marine species that are typically considered too difficult to culture in captivity. They are pelagic spawners, produce small eggs, and have an extended larval period. 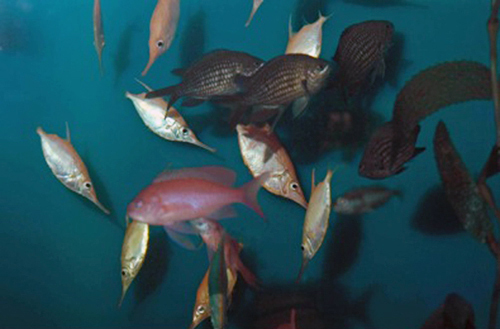 The knowledge gained from the propagation experiments described herein, may therefore be useful in research of aquaculture techniques for other difficult families such as angelfish and serranids. Mediterranean fishes exhibit at the Toledo Zoo. The original group of boarfish were acquired from the Musée Océanographique de Monaco in 2001. Captive reproduction was reported at the Toledo Zoo in 2007; and egg collections made there in 2008 – 2010. With their extended pro-larva stage, it was learned that copepod nauplii must be used in rearing them, yet despite this they were still very delicate. One fish was raised from eggs the Toledo Zoo sent to Atlantis Marine World. Natural History There are 17 species of boarfish are found in temperate and tropical deepwater regions throughout the world (Fishbase 2009). Their relatively large eyes and reddish coloration indicate that these fish are normally found in low light habitats. A generally peaceful species, boarfish are active predators of small shrimp (Hemdal 2006). Capros aper ranges throughout the Eastern Atlantic, from western Norway south to Senegal, including the Mediterranean Sea (FishBase 2009). Normally a fish of moderate depths, in some regions, schools of boarfish are found at the surface, as evidenced by numerous shorebirds found to prey on this species. Photographs of these fish by underwater photographers show these shallow water fish have a much different color pattern (Wirtz in FishBase 2009). 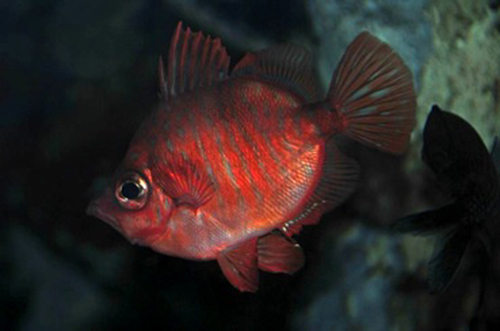 Normal Capros aper are reddish, with darker red stripes on the males. The shallow water fish are more elongate and have pale straw colored bodies, and the base of all unpaired fins are bordered in black. It may be that they represent a different sub-species, or at least a shallow water color form. Boarfish are an “r selected species” in terms of their reproductive strategy. This is evidenced by the small size of their offspring, huge numbers of eggs produced, and lack of parental care. They do have some “K selected” attributes; notably their relatively long lifespan (15+ years) and slow maturation (Hemdal 2003). A mob of fish eating recently released boarfish eggs. Captive Reproduction The Toledo Zoo acquired ten boarfish as a generous donation from the Musée Océanographique de Monaco (the Monaco Aquarium) in 2001. They were placed in a Mediterranean fishes exhibit, (along with snipefish, Anthias and chromis) where they were displayed for many years. 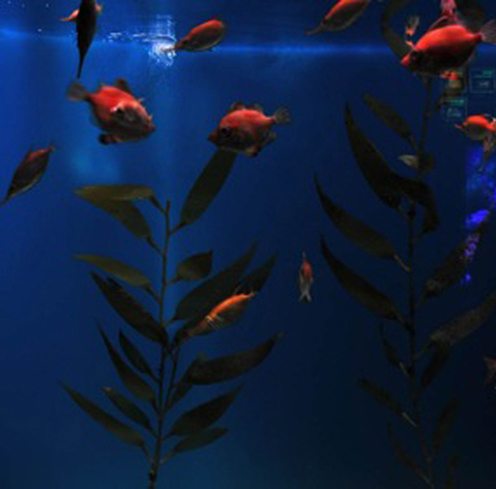 In 2007, egg-feeding behavior was noticed among the fish in the exhibit, but the producers of the eggs were not determined. In 2008 viable eggs were recovered from the exhibit, incubated and hatched out; the resulting larva were determined to be from the boarfish. This was the first reported captive reproduction of this species. Collections of fertile eggs from the boarfish were made from 2008 through 2010, forming the basis of this report. 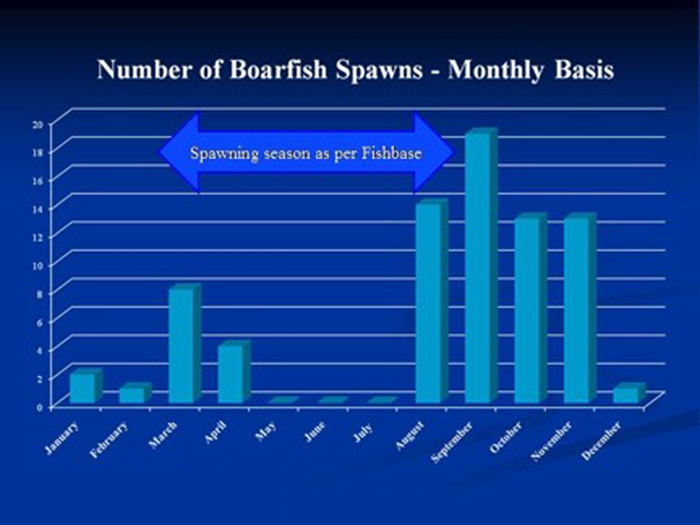 Boarfish spawning – male is below. 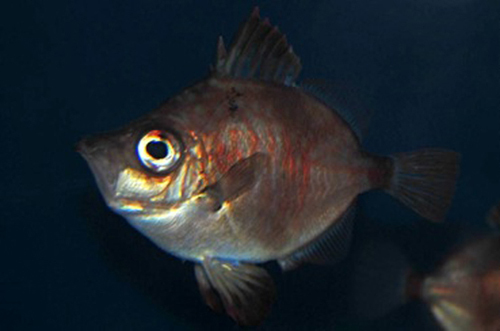 Most boarfish spawns occurred within an hour of the tank lights being turned on in the morning. The male fish would drive the female towards the surface in a spawning run. In most observed cases, the actual spawning occurred right at the surface, after multiple runs. This seems to imply that the 40” tank depth was too shallow for proper courtship and spawning behavior. Competitive interaction between males seemed to increase successful reproductive events, if two males attempted to engage a female at the same time; gamete release was more commonly seen. If only one male showed interest, there was a greater chance of a “false run” resulting in no eggs being released by the female. 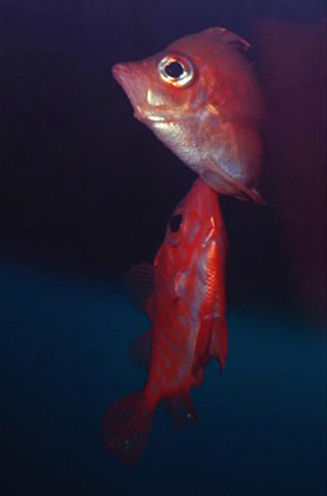 Captive boarfish reproductive events show two seasonal peaks – early spring and then a stronger peak during the fall. This was opposite of the wild spawning season reported in Fishbase. Egg Collection / Shipping Eggs were collected from the boarfish tank using a soft, fine mesh net about 15 minutes after a morning spawning event was observed. Collecting the eggs sooner resulted in poor fertilization rates, while waiting any longer allowed the aquarium’s inhabitants to eat most of them. Once collected, the eggs were placed into containers holding around 250 eggs in 500ml of tank water. At this point, they were either incubated at 67 degrees F. or prepared to be shipped to Atlantis Marine World. Approximately 500 eggs packed in 2 liters of water that was pre-charged with oxygen, but with no free bubbles remaining. Shipments were made by FedEx Priority overnight; shipments made in the fall were done at ambient temperature, and ice packs were used in the summer. 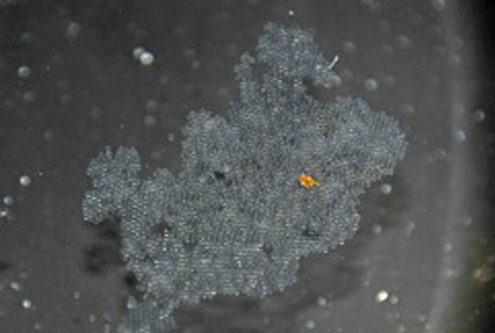 Boarfish egg raft floating at the surface after removal from exhibit. 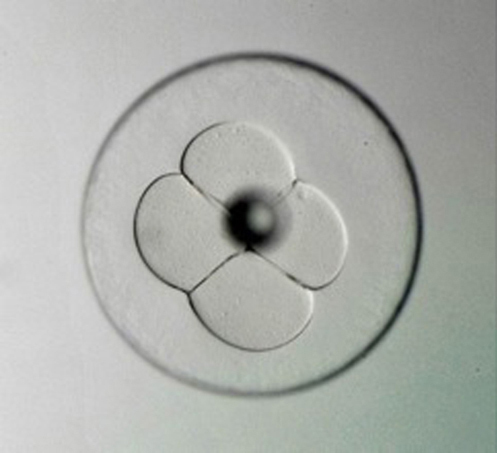 Boarfish egg three hours after fertilization. Larval Rearing at the Toledo Zoo At the Toledo Zoo, eggs were incubated in static cultures with limited aeration. Strong aeration negatively impacted hatch rate and larval survival. The water temperature was controlled by room air conditioning and held to 64 to 68 degrees Fahrenheit. The specific gravity ranged from 1.022 up to 1.025 (due to evaporation) and was never changed more than .0005 specific gravity units at one time. The pH was not controlled, and the ammonia concentration was kept at less than 1ppm using water exchanges or ammonia neutralizing compounds. Low levels of light were maintained over the rearing tubs at all times because photoshock was otherwise a factor. Surprisingly, the larva were negatively phototaxic. Siphoning the bottom or skimming the surface often caused larva mortality due to unknown reasons, so dipping the larva out and moving them to a clean rearing tub was a better means to ensure environmental quality. Brachionus plicatilis rotifers were used as a first food and were added, along with Isochrysis algae cultures beginning between day three and five. 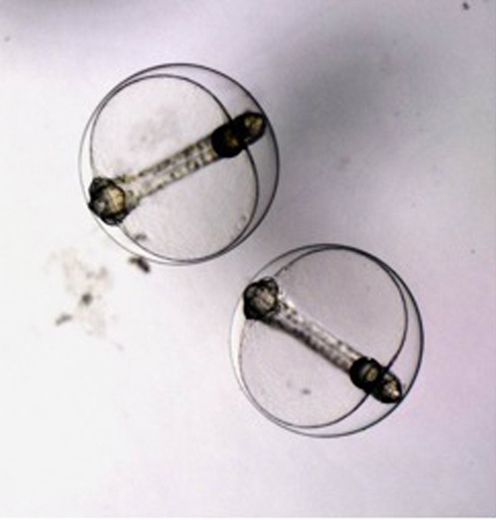 Boarfish larva younger than three days old were unable to feed on rotifers. 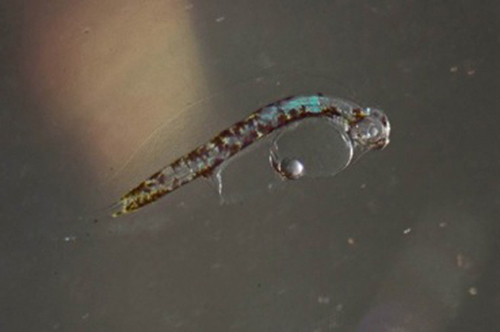 In later attempts, Tisbe copepod nauplii were added to larval rearing tubs and longevity increased to a maximum of 26 days post-hatch, but no fish developed through the post-flexion stage at the Toledo Zoo. Larval survivorship at the Toledo Zoo showing a general increasing trend (black line) – indicating that problem solving and additional practice was helping to improve success. The drop in longevity from batch 17 to 18 was due to an 8 month hiatus, and the need for the staff to “re-learn” some of the techniques from the previous year. Larval rearing log from Atlantis Marine World On March 25, 2009 boarfish eggs from the Toledo Zoo arrived at Atlantis Marine World, packed in standard fish bags, with ice packs in the boxes. The eggs were acclimated for temperature only, into a 55-gallon, black polyethylene cylindrical tank. Filtered natural seawater of approximately 25ppt was used and temperature was maintained around 68 degrees Fahrenheit (20 degrees Celsius) by virtue of a corner of our behind-the-scenes area with relatively stable temperature. A small overhead incandescent light illuminated the tank 24h/d. By the morning of 3/25, approximately 200 prolarvae could be seen circulating around the tank under gentle aeration. A clearly visible yolk sac slowly diminished over the next few days and by 3/30 (day 4 post hatch) it was decided that they were ready for food. Examination under a microscope led us to believe that Rotifers would probably be too large as a first food organism. Nevertheless, S-strain rotifers, as well as the ciliate, Euplotes, were collected from cultures using a 35-micron sieve and added to the rearing tank. Phytoplankton (Isochrysis galbana) was also added in sufficient concentration to reduce visibility to approximately 30cm. Isochrysis is a tropical alga and so is probably not the ideal species for this project, however it was the only species in culture at Atlantis Marine World at the time. Phytoplankton plays two important roles in larval rearing tanks. With high concentrations of fish larvae and other zooplankton (food), filtration is nearly impossible, so the ability of phytoplankton to nitrify ammonia and nitrite, while stabilizing pH as a by-product of carbon fixation makes it an important tool in water quality control. It is also useful in maintaining zooplankton populations and their nutritional profiles. On 3/31 (day 5 post hatch) larvae did not appear to be eating. Although it is possible that they simply weren’t ready to feed at that point, we decided to add approximately 1000 adult copepods (Acartia hudsonica) in order to maximize their food choices. At approximately 800 microns in length, the copepods were not intended to be food, however, over the next few days [as planned] their reproduction resulted in the appearance of abundant nauplii in the rearing tank. By day 6, post hatch the larvae could be seen actively hunting and feeding and by day 8, they were swimming more rapidly and food could be seen in their stomachs. On day 10 post hatch, the rearing tank was connected to a bio filter containing only plastic bio balls. The water exchange with the bio filter began as a moderate drip and was slowly increased to a rate of approximately 20 liters per hour over the following weeks. A 120-micron mesh was placed on the overflow to prevent larvae from being flushed out. The airstone was secured directly beneath the overflow in order deflect larvae away from it. Phytoplankton, rotifers, and copepods were added daily. Water changes were accomplished by flowing seawater through the 80-liter bio filter. On day 12 several dead larvae were observed on the bottom of the tank. They were immediately siphoned out and the rate of water exchange was increased. In spite of every effort to maintain excellent water quality through water changes and meticulous siphoning, the larvae continued to die – a few each day for the next two weeks. Each day, the remaining larvae continued to look strong, swimming rapidly and eating well. By day 29, only 4 larvae could be seen in the tank. On day 30, they were observed staying close to the bottom. While shining a light on the bottom to get a better look at the remaining boarfish larvae, a large hydroid colony was observed growing on the bottom of the tank. Hydroids can be disastrous in a rearing tank for two reasons: first they can sting and kill larvae, and second, they are capable of consuming a large quantity of the zooplankton, making it difficult to maintain food concentrations. The hydroids were removed with a siphon to the best of our ability. On day 33 post hatch, three settled postlarvae were observed near the bottom of the tank. We discussed moving the three boarfish to a new tank to eliminate the possibility of further hydroid related losses, but we decided that they probably were not yet ready to cope with the stress of a move. Unfortunately, two days later, two of the remaining juveniles were found dead on the bottom, apparently caught up in a fragment of the hydroid colony. The one enduring boarfish was removed and placed in a 10-gallon (38-liter) tank where it was kept for grow out until it was sent back to the Toledo Zoo at about day 120. A subsequent batch of eggs was received at Atlantis Marine World and larvae were reared using the same protocol as outlined above. In preparation for this second attempt, the filter for the rearing tank was plumbed into a larger, chilled system so that water changes could be accomplished more easily (continuously, if necessary), and a lower temperature could be maintained (approximately 60 degrees Fahrenheit – 15.5 degrees Celsius). The improved system appeared to have a significant impact on larval survivorship. At day 25, larvae were too numerous to count but numbers were estimated to be between 50 and 100. At day 29, they did not appear to be quite as numerous, but the fish density was still very encouraging. Unfortunately, the numbers dropped rapidly over the next few days and by day 34, no larvae could be seen in the tank. Upon emptying the rearing tank, a very large hydroid colony was discovered covering most of the tank bottom. Although connecting the tank to the larger system may have helped survivorship for much of the larval period, it may have ultimately led to the failure of this batch by permitting hydroids to contaminate the rearing system at an earlier stage. Hydroids remain a nuisance in aquaculture, especially for species that have a prolonged larval stage. The addition of high densities of zooplankton, with minimal filtration creates an ideal environment for a hydroid bloom. The use of tall, dark cylindrical tanks and a high density of phytoplankton can further compound the hydroid problem by making it very difficult to observe hydroid colonies growing on the bottom until it is too late. Eggs 32 hours after fertilization. Boarfish larva 12 hours after hatching. 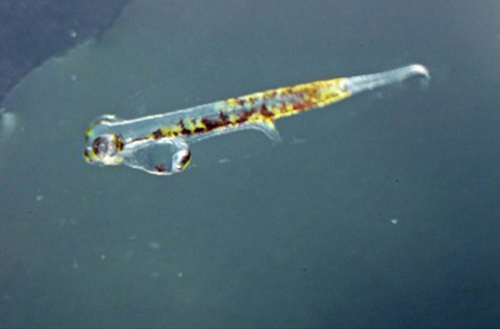 Boarfish larva at 30 hours after hatching. Days 1 to 4: Water agitation prior to hatch will kill the eggs. Problem with attempts to remove surface oils, causing larva to float. Days 20 to 40: Environmental issues – culture contaminants, etc. At all times, ammonia control was an issue in static cultures. Boarfish larva 64 hours post hatch. Boarfish at Toledo, 12.5 days after hatching. Post Larval Rearing Feeding the juvenile boarfish was a simple matter of gradually increasing the food size as it grew; from Artemia nauplii, to half-grown Artemia enriched with Selco, to diced frozen mysids and then to whole mysids over the course of a year or so. From the post flexion stage, where the larva develops a caudal fin, the baby boarfish was highly susceptible to photoshock – from a camera flash for example. The fish was a year and a half old before we felt comfortable moving it from its isolated rearing tank to a public exhibit containing other fishes. Conclusion Because of their restricted availability and cool water requirements, this species is destined to be of interest only to public aquarists and researchers. 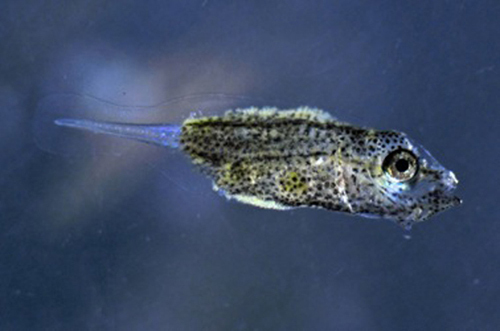 However, the techniques used to raise these fish through their prolarval stage, using only captive propagated foods, has a great potential benefit for tropical marine aquarists attempting to raise other species of more interest to them. One of the authors, (Hemdal) was contacted by a researcher in Ireland. It turns out that boarfish are normally very rare in the waters around Great Britain, but in recent years, they have been netted in huge numbers by commercial fisherman working in deeper water. Why this sudden change in their populations? The researcher has hypothesized that global climate change has created new suitable habitat for this species in areas where they were once very rare. 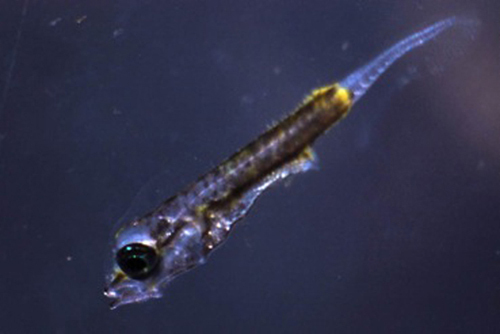 The Toledo Zoo supplied a series of preserved larval boarfish to this researcher, so that he can better identify this species when it appears in plankton nets in his home area. 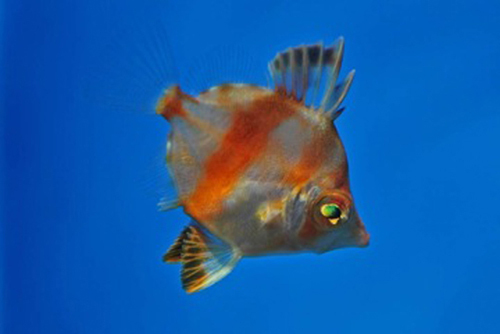 The one boarfish raised by Atlantis Marine World has since been placed on exhibit at the Toledo Zoo with the adult boarfish, snipefish and other Mediterranean fishes. Future attempts at rearing these species may include bolstering the nutritional profile of the rotifers by culturing multiple species of algae that complement one another in terms of their fatty acid profiles, and then feeding them to the rotifers and in turn, to the larval boarfish. One side-benefit from this project for the Toledo Zoo staff has been an increase in their overall culturing skills; allowing for greater ease in raising other marine species such as clownfish, seahorses and golden damselfish. By “reading between the lines” of this article, the authors hope that aquarists can use the information presented here, for captive reproduction of other, more commonly seen tropical fish species. 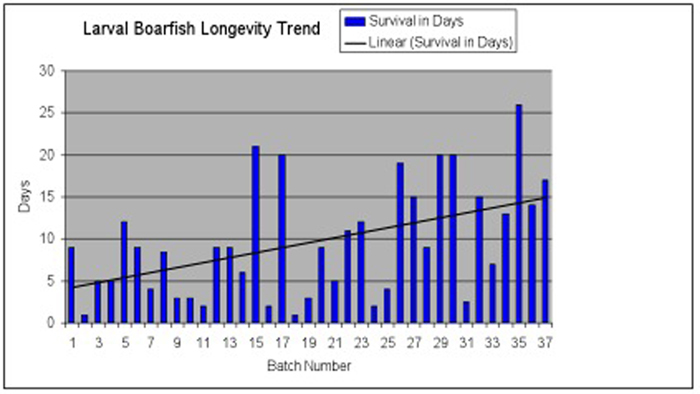 Certainly there is always a risk of over-extrapolation, and the limited success (one fish raised to adulthood) means that there is more work to be done, but this can serve as a good start for people trying to raise marine fish solely on cultured food items (as opposed to wild-collected plankton). References Froese, R. and D. Pauly. Editors. 2009. FishBase. World Wide Web electronic publication. www.fishbase.org, version (08/2009). Hemdal, J.F. 2006. Advanced Marine Aquarium Techniques. 352pp. TFH publications, Neptune City, New Jersey —— 2003. Aquarium fish breeding. 169pp. Barron’s Educational Series. Hauppauge, New York Todd Gardner is from Atlantis Marine World and Jay Hemdal is from the Toledo Zoo.